The landings at Cape Helles, as at the Anzac area, were supposed to be the opening of rapid advances across the peninsula to neutralise the shore batteries along the Dardanelles Straits and allow the navy through. If some accounts are be believed, there was also a proposal that the army ought to continue onwards and capture Constantinople (modern Istanbul). Within two days however the plan had failed and the allies were ‘kettled’ in to two bridgehead areas. This unexpected hold up quickly brought to light the urgent need to establish water supplies, given that the expected capture of sources as the infantry advanced was not happening. Wells were dug where possible, but supplying so many thousands of troops was a critical issue. 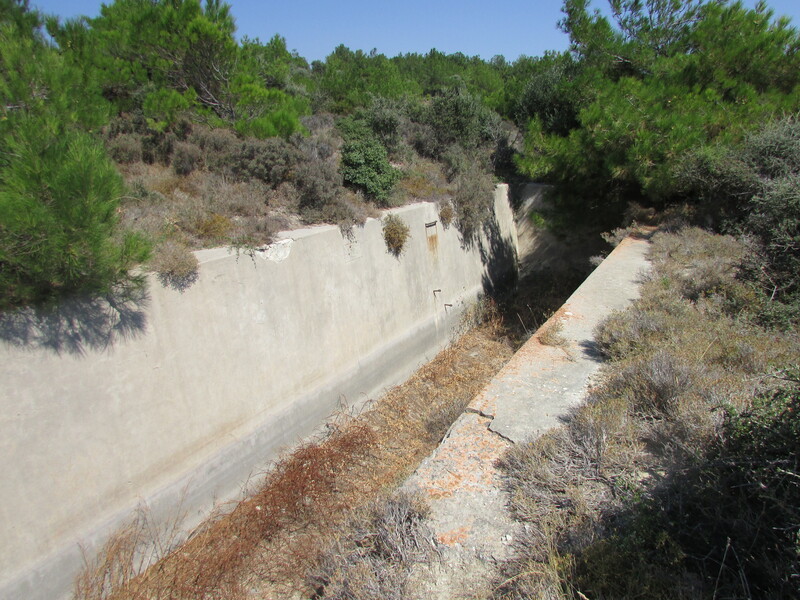 Once W Beach was properly secured, the Royal Engineers built two 30,000 gallon water tanks into the seaward slope of Teke Burnu, affording a little protection from shelling. No doubt they were covered when in use. The tanks are still impressive. One has an Arabic inscription on one of its inner faces, which is a little puzzling, but since, as mentioned elsewhere, this whole area of hill 114 was a Turkish military base until the early 1980s, it is quite possible that the tanks were made use of after 1915. Warning: The tanks are quite deep and there is no protective barrier along their sides. The usual cautions apply! If you head broadly northward from here, keeping to the higher plateau, you will emerge in to an area where there are ruined buildings and gun platforms belonging to the now-abandoned Turkish base.